Liposuction is one of the most popular plastic surgery procedures in the world because it has allowed the dream to become reality. It corrects a very frequent anatomical problem which is the localised excess of fat and restores balanced proportions between different parts of the body without scarring, thereby giving harmony to the figure. The original French medical term "lipoaspiration" has gradually been replaced in everyday language by the term "liposuction", derived from the English name for this technique. Also, at the same time and if required, firmness can be restored to the tissues that have emptied or collapsed (buttocks, breasts, scars,...) by injecting your own fatty tissue (Lipofilling). This is called liposculpture because it reshapes the figure by removing localised fat (liposuction) and by boosting sagging areas (Lipofilling). This new harmony gives you a feeling of balance and self-confidence, whether clothed or naked. 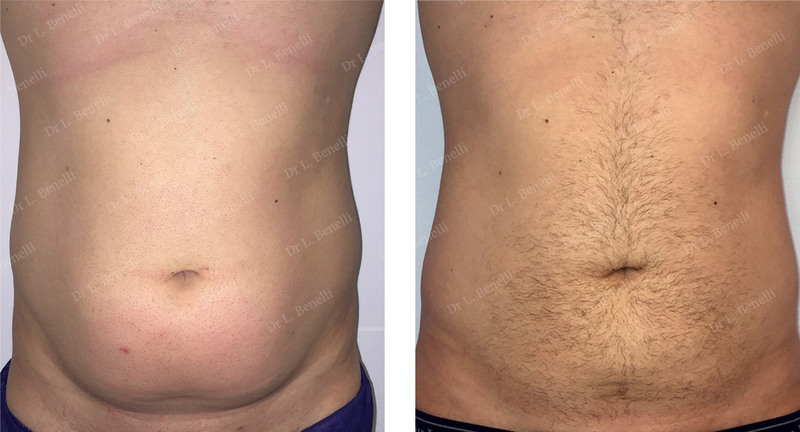 The art of liposuction is not only about removing localised fat but is also especially about retracting the skin in the aspirated areas to obtain a "lifting" effect with contour regularity in the treated area. Therefore, the direction of the tunnels created by the suction cannula will determine the regular retraction of tissues and skin. This is why I think the term that best defines the operation is lipo-smoothing because it focuses on erasing any fatty contours, leaving a skin as smooth as possible. It is important to prioritise the uniformity of the retracted skin after the operation. For people who are generally carrying excess weight, liposuction is not for losing weight but will reduce localised fatty areas that persist despite diets. These areas can interfere with weight loss attempts because the figure continues to look out of proportion despite dieting, which seems to make all efforts in vain and so discouraging patients. This exposes them to the risk of the yoyo phenomenon as they gain weight just after having lost it. Conversely, the operation can have a motivating effect because efforts at dieting are rewarded by an overall trimmer figure. Liposuction is not an alternative to a weight loss. This intervention aims to remove localised excess fat and treat areas that are resistant to diet or exercise. This discord is usually constitutional and hereditary like the rest of your anatomy. Those who are generally overweight all over, without significantly localised fat; natural weight loss by dieting will help you to regain a slimmer figure. For those who have very saggy skin after significant weight loss where a misshaped figure may persist due to sagging skin and not to excess residual fat. Other operations can be used for this such as abdominoplastyor a body lift. So, depending on the observations made during the first consultation, the operation could possibly be combined with another procedure, such as an abdominoplastyor a body lift. These can be performed during the same procedure or at another time. During the first consultation, I will evaluate the techniques and areas to treat using liposuction and lipofilling, if necessary. It is essential that you and I have a good understanding when deciding to operate and to determine the technique to use among from those I can suggest. It will be necessary to carry out a blood test, depending on the type of anaesthetic (local or general). In the event of a general anaesthetic, you will need a consultation with the anaesthetist in the weeks leading up to the operation and at least 48 hours beforehand. You will be proscribed a lipopanty to buy as a specific post-operative support and you will need to bring this on the day of the operation to wear at the end of the operation. If you are having a general anaesthetic, you will have to fast strictly for 6 hours before the operation (do not eat anything, chew gum, eat sweets or smoke). For local anaesthetics, however, you can drink and eat lightly at normal mealtimes. Your stay in hospital is usually limited to half a day in a day clinic. An overnight hospital stay may sometimes be necessary depending on the scale of the operation. The duration of the operation varies from 30 minutes to 1.5 hours, depending on the number of areas to be treated. Before you go to the operating theatre, in your room, I will go over the precise goals with you as we agreed during the consultations. You can then always make recommendations and ask any questions. I will then draw the lines and marks on your skin to guide the operation and determine the entry points for the cannula, the direction of the tunnels that will determine the skin retraction, as well as the extent of the areas to by treated by liposuction or lipofilling, if necessary. Fine 3mm incisions are made at the cannula entry points. The localised fat to be treated is infiltrated with a mixture of saline, local anaesthetic and a product to limit bleeding, using a micro infiltration cannula (1.5 mm). Liposuction is then performed with a suction cannula. Using small diameter cannulas allows the suction of excess fatty tissue to be non-traumatic and more regular. The direction of the tunnels created by the suction cannula will determine the regular retraction of tissues and skin in particular. The art of liposuction is not only about removing localised fat but is also particularly about retracting the skin in the areas where suction has taken place to obtain a "lifting" effect and regularity to the contours in the treated area. Suction can be mechanical (with a vacuum cleaner) or manual (by simple syringe). Instruments are chosen according to the areas to be treated. A stitch is inserted to close the different routes and is placed in the thickness of the skin, which makes it invisible. The stitch is absorbable and therefore does not need to be removed. At the end of the operation, you will need to wear a moderately compressive lipopanty to maintain tissue retraction and limit the formation of post-operative bruises and swelling. During the night and days following the operation, there may be a painful sensation of tension in the area that was operated on, such as aches and pains, which may impair your mobility. These pains are moderate in a resting position and may require analgesics, which are given by a drip in hospital or can be taken in tablet form at home. This post-operative pain will reduce and disappear within a few days of the operation. You can walk the same day of the operation. Swelling (oedema) and bruising may occur and it takes about 4 weeks for this to disappear. As the stitches used are absorbable, they do not need to be removed. They are placed inside the skin’s thickness and are invisible. You will need to take time out from professional and social activities for 2 days in the majority of the cases. In addition to wearing the lipopanty day and night for 3 to 4 weeks, clean your scars with an antiseptic after showering. You will need to book a follow-up visit the week after the procedure and then again after 1 month, 3 months, 6 months, and 1 year. You can resume any sporting activities as soon as any painful discomfort has subsided. Walking is highly recommended in the days after the operation because muscular activity promotes tissue drainage in the area that was operated on and limits the risks of phlebitis. Standing still for long periods is not recommended. When resting, the recommended position is lying on your back or side with your feet slightly raised. Exposure to the sun: No sun exposure while there are traces of bruising, no matter how slight. Then, exposure is allowed using a sunscreen with a maximum sun protection factor. The result will be a trimmer figure with skin retraction and is immediately visible despite post-operative swelling. This will continue to improve in the weeks and months following surgery. In the long term, the result will stabilise and will be sustained. The treated areas will not regress because fat cells do not multiply. Any weight gain will be uniform over the whole body. Furthermore, eliminating localised areas of fat that can block weight loss attempts -as they are resistant to dieting-is an incentive to carrying on with dieting efforts and this will be rewarded by an overall slimmer figure. The cost of the operation will depend on the procedure, the duration of the operation, the type of anaesthetic and any hospital charges. On the other hand, if the problem is causing you functional issues, you may be covered by Social Security and, where relevant, by your mutual insurance company.